The end of the school year is here, as is England’s usual capitulation in the European Football Championships. Just a remind to all seniors to hand in any outstanding coursework before the end of the year. Please see the below details for the Senior Wind up for East and West students. Senior students and any Intermediates that would like to play, have been invited to take part in the Dundurn Canada Celebration. This will also serve as the year end wind up for Senior Students. What to bring –> Music and folder, Money if you want to buy lunch or get there early for a pancake breakfast at Dundurn Community Hall. NO UNIFORM, just dress casual! PLEASE RSVP AS SOON AS POSSIBLE TO LET MR. MARTIN OR MR. WARD KNOW IF YOU ARE ATTENDING SO WE CAN HAVE THE RIGHT AMOUNT OF STANDS. Please see the attached file and information below to sign up for next year. While students can still sign up in the Fall we want to be able to organize our instrumentation and instruction for next season. Please don’t hesitate to contact Mr. Ward or Mr. Martin if you have any questions, concerns or want more information. As a very successful year draws to a close we would like to invite any former music students that are interested to rejoin the program in the fall of 2016 and also extend an invitation to other students that might have missed the opportunity to join music classes in the past. There are several different ensembles in the Prairie Spirit East Music Program. Regardless of age, all students learning an instrument for the first time join the Beginning Band. Older students from grade 7 upwards will have the chance to be fast tracked to Concert Band after December if they have made adequate progress. Students with more than one year’s previous band instrument experience join the Intermediate Winds, which is a developing band for players that have either graduated from beginning band, have returned to the program or for Senior Winds members that have taken up a second instrument. Anyone that is interested in playing in the Senior Winds must have at least 3 years playing experience and should have a short meeting to talk to the band director. As with beginning band, students in Concert Band can be allowed to play in the Senior Winds upon the band director’s digression. Any students interested in returning or starting up to the program is encouraged to contact Mr. Martin or Mr. Ward – as soon as possible or before June 22nd so we can plan and schedule classes in the fall. There is a band information session and a chance to pre-reserve band instruments for the fall as listed below, in each case the band directors and representative s from local music stores will be on hand to help. There is also information about our programs attached to this letter. Please email or contact will.martin@spiritsd.ca to confirm your interest. If you have any other questions or concerns please do not hesitate to contact me by email or phone. The music classes are a fully credited subject. Instruction is given in-school on a regular 6-day school cycle. It is recommended all band students practice on average 15-30 minutes per day to both build and maintain necessary muscle strength and stamina and to facilitate constant improvement. Instruments are rented or purchased by individual students from music stores in Saskatoon, but are also available from the division if financial assistance is needed. Beginning Band is for all students in their first year playing an instrument. All beginning students rehearse separately in their home schools but come together for several events throughout the year. Including concerts, Dalmeny Music Festival and a Beginner/Concert Band day retreat. Students starting in higher grades can be fast tracked into Concert Band after December if quick progress is made. The Concert Band is developing level ensemble for instrumentalists that have graduated from Beginning Band, returning students or members of the Symphonic Winds that have taken up a second instrument. This is in addition to the regular instruction given during the school day- students are transported by school bus from their homes schools. The concert band regularly participates in music festivals such as Dalmeny and Moose Jaw. The Symphonic Winds is a higher level band for players that have been playing three years or more and concentrates on a higher standard of repertoire. The Symphonic Winds takes part in music festivals, retreats and tours across Saskatchewan, Alberta and beyond. This is in addition to the regular instruction given during the school day- students are transported by school bus. The Jazz band is for students that have been playing five years or more. Students in Jazz Band also have the option to take an extra credit class in their home schools every week where they learn a mixture of Jazz History, theory and improvisation skills to supplement learning in the general music/band credit class. Junior Jazz Bi-Weekly @ Allan School The Junior Jazz band is for students that have been playing for 1 year or more and acts as an intro to Jazz, pop and other mediums of music. Students have a chance to play their band instruments or if they already play guitar, bass, piano or drums to utilize and improve upon those skills in this setting. Prairie Spirit School Division is pleased to announce some changes to the East and West band programs for the 2016/17 school year. We conducted a survey of educators, parents and students (current, former and prospective) in January 2016, with the purpose of increasing engagement and participation in our band programs. The survey identified several barriers to participation in the band programs. The most significant barrier is the current after-school rehearsal format, which is part of the instructional time. • Starting in September 2016, students in grades 6-12 will be bussed to band rehearsals, at a central hub, on every other Wednesday afternoon (1 to 4:30 p.m.). o Sectionals – separate rehearsals for brass, woodwind, percussion, etc. Our surveys indicated that the after-school rehearsals were the most significant barrier to participation in band. These rehearsals often conflict with other extra-curricular activities and make a very long day for students. We believe that the new format will offer a high quality musical experience for all band students. What was the process that led to these changes? Last September, the Prairie Spirit Music Education Team began a consultation process that led to these changes. The Music Education Team consulted with administrators, senior School Division administration, the Prairie Spirit Board of Education, the East and West Band Parents’ Associations, the University of Saskatchewan and the Prairie Spirit bus garage. How you can support your child? • We are interested in hearing from you as we move ahead. Please provide feedback to your band teacher or to Dave Carter, Coordinator of Schools and Learning. • The bi-weekly rehearsals are an essential part of the band program. Please encourage your child to attend the rehearsals. • We have parent organizations for both the East and West band programs. The final Division rehearsal of the 2015/16 school year is upon us and we are hugely excited to welcome world renowned Euphonium artist and educator Dr. David Thornton to Clavet to work with both the Intermediate and Senior groups. Concert Review and opportunities! – David Thornton and Dean McNeill perform this Saturday evening. What a great week of concerts, thank you to all students, staff and parents for making this week of concerts such a great success. Our program would not continue to grow without your fantastic support. Before then there are many opportunities this weekend to seek out and listen to some fantastic concerts. Especially for Senior Students that haven’t yet handed in Concert Reviews. 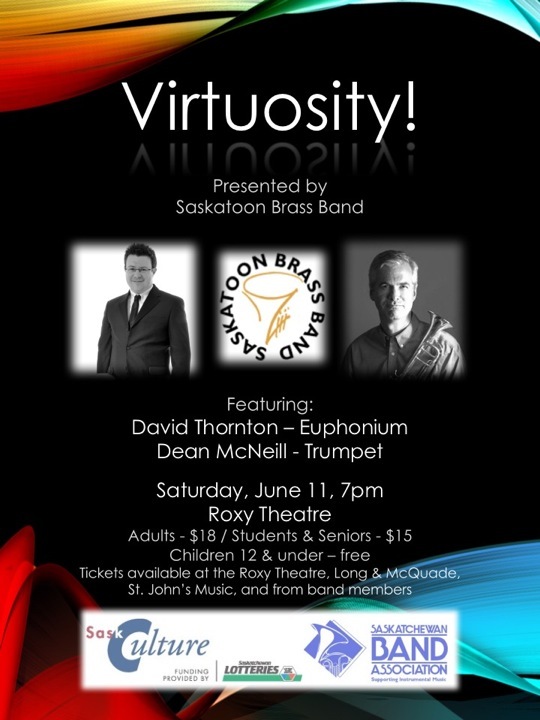 Firstly if you are free this coming Saturday June 11th come and see David Thornton and Saskatoon’s own Dean McNeill perform an unmissable concert with the Saskatoon Brass Band, 7pm at the Roxy Theatre on 20th. The show will feature some unbelievable Euphonium solos, a world premiere of the piece “Kalla’ by Alan Gilliland for Brass Band, featuring Dean McNeill plus much more. Please see the poster below for more details. If you are busy Saturday, cancel your plans and come anyway! Also this weekend see’s the start of the Saskatoon Opera’s production of the Barber of Seville and the Strata Music Festival at a whole host of venues around 20th featuring brand new music crossing over multiple genres and different instruments.